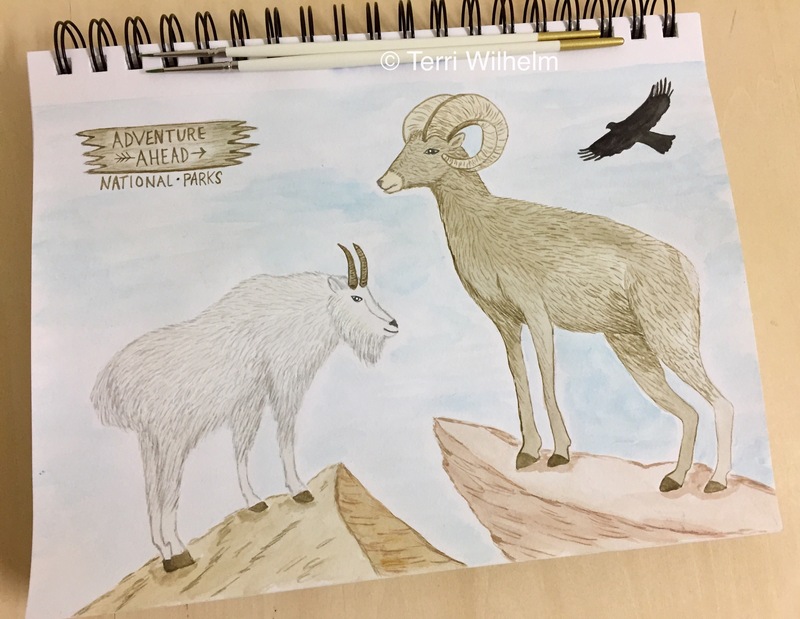 My theme for October is national parks wildlife, so week 42 in my animal art series features a mountain goat and bighorn sheep. You may have sightings of these animals in the Rocky Mountain, Yellowstone, Olympic, and Glacier National Parks. Bighorn sheep are known for their ability to climb steep terrain to avoid predators. They travel in flocks and feed on grasses and shrubs throughout the year. Mountain goats are known for living on rocky cliffs at high elevations throughout the year. They have special hooves with traction-creating inner pads to give them sure footing on steep, rocky slopes, beyond the reach of most predators.